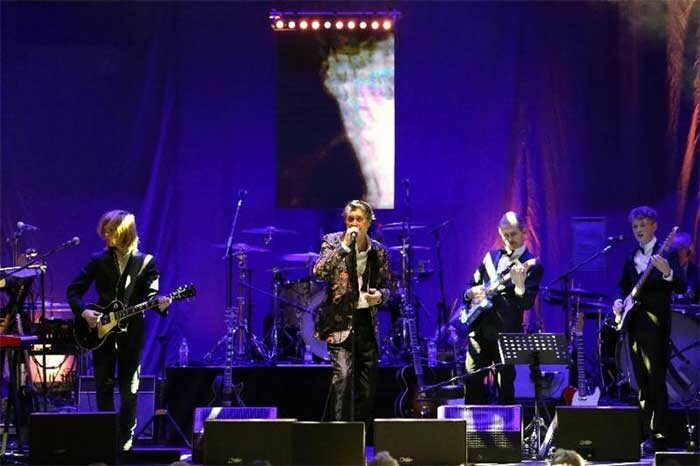 UK - Live music lighting designer Rod Clay is making good use of the colour rendering technology of Philips Vari-Lite's VLX3 LED Wash luminaires to provide key light for Bryan Ferry during his 'An Evening with Bryan Ferry' tour. Ferry remains the ideal combination of mystery man and rock star and Clay's flattering and restrained lighting palette artfully reflects this. Conjuring up an intimate, smoky jazz club feel on the show's opening, half way through he seamlessly segues into dynamic concert style lighting backed by bright video imagery. Clay's fixture palette, supplied by technical and creative production company One Big Star, includes Philips Vari-Lite VLX3 Washes for front, face and key lighting and Philips Selecon Rama Fresnels make up much of the cross lighting floor package. Clay discusses: "We wanted a tungsten/jazzy feel for the opening of the show so that's why we went with Philips Selecon Rama Fresnels for side lighting and, new for me, 12 of the Philips Vari-Lite VLX3s, which provide key, face and front light. This kept things simple and worked in some old-school glamour." Initially One Big Star was only providing the floor package but the tour grew into a slightly larger festival version and then into a full production package for the autumn /winter tour. This led the company to invest in the Philips Vari-Lite VLX3 Wash luminaires. "OneBigStar has been with me all the way. In fact the company has made quite a considerable investment to keep me happy and their support has been invaluable! The VLX3 Wash is great for a show like this," says Clay. "The fixture combines all the benefits of LED technology with the best of Philips Vari-Lite traditional intelligent luminaires. Colours and intensity are excellent and the range of white colour temperatures is particularly useful for front and key light. In addition, the fact that we can dispense with dimmers and associated cable saves the tour money and energy - including time loading in and out - plus of course space in both the venue and the truck." From OneBigStar's perspective, the new Vari-Lite equipment is a welcome addition to its equipment arsenal. Operations Director Steve Yeardsley explains, "When it comes to buying new kit what drives our decision is the diversity of the projects we work on - everything from corporate launches and events to rock and roll touring. The kit has to be as useful on one as it is on the other. The Vari-Lite VLX3 Wash is relatively small for a moving head. It delivers fantastic output from its three 120-watt RGBW LED chipsets. It's up to three times the efficacy of comparable tungsten sources and offers more than 6,000 lumens of white light output. Its zoom range from 15 to 55 degrees and its smooth, silent, and accurate movement make the VLX3 Wash ideal for use front of house and overhead. Touring them means less dimmers, less power used and less cabling and weight so, for us, they are a win, win all round." Martin Palmer, Vari-Lite and Showline product manager for EMEA adds: "We were delighted to see One Big Star invest in the VLX3 Washes for this tour. Rod Clay's lighting is subtle and theatrical. He needed a luminaire that would emulate traditional tungsten fixtures. The luminaires dynamic CRI provides a white range between approximately 3000 and 9000 Kelvin making it ideal for the job. In addition the VLX3 Wash behaves like familiar arc or tungsten luminaire, delivering seamless colour mixing, but without the inherent associated costs and inefficiencies." Having performed 21 shows around the UK including the five-Star reviewed performance at The Royal Albert Hall, Ferry, his band and The Bryan Ferry Orchestra, performed an extra UK date at the Shepherds Bush Empire in aid of the Disasters Emergency Committee Philippines Typhoon Appeal. The tour has now moved on to do dates in the Ukraine.